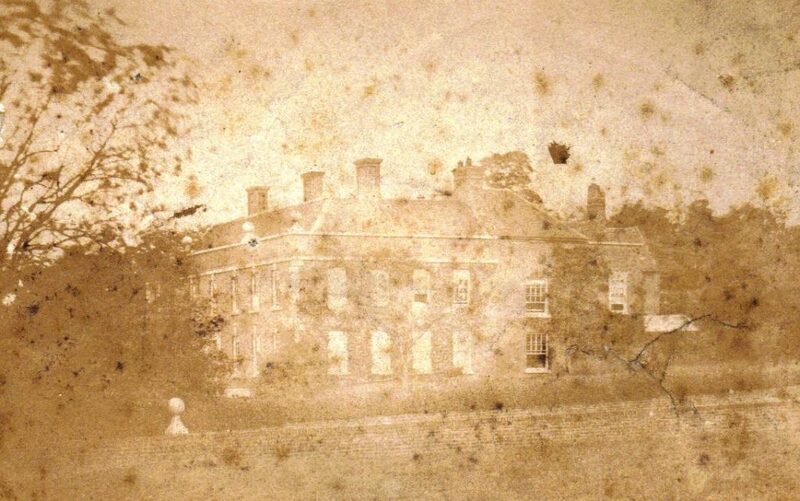 Penn Hall was rented by Henry John Marten in the 1850’s and was the birthplace of most of his children including his daughter Floss. There is a good description of its history on the Wolverhampton local history web site. This photo could date from the time the Marten family lived there – it is labelled and found with other Marten family photos. This grand building has a number of other significant family connections on this web site as it was owned by the both Bradneys and the Pershouses. The house itself was largely built by Dr Raphael Sedgwick, who was married to the great granddaughter of John Bradney, a family who owned the land in Penn back to the sixteenth century. Thomas Bradney who inherited it from Dr Sedgwick in 1747 had two daughters. The older Esther Bradney married into the Marsh family, who subsequently married into the Evans family when Charles Evans married Sophie Marsh of the Lloyd on 3 Jan 1804. Their heirs lived at the nearby Lloyd House. The younger daughter Ellen Bradney married a Pershouse who subsequently married with the Shaw Helliers. The whole inter-marrying and single child families came to a sterile conclusion in 1899 when Thomas Bradney Shaw-Hellier married his cousin, Harriet Bradney Marsh Evans, Charles Evans’ granddaughter.